Time magazine has published a variety of covers about President Donald Trump, but few have struck a chord like the one released on Thursday. Against a red backdrop, the image of a crying immigrant child — a cutout from a Getty Images picture from photographer John Moore that has come to represent the ongoing border crisis — is juxtaposed next to the president. 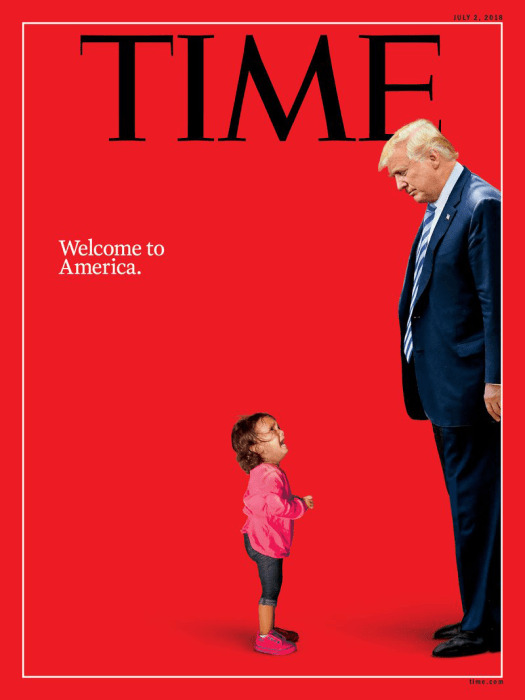 Trump looks down at the child alongside the words, "Welcome to America." The cover comes a day after Trump signed an executive order to stop his administration's policy of separating immigrant children from their families at the U.S. border. The policy has become a flashpoint across the U.S., drawing extensive media coverage and fundraisers for nonprofits dedicated to helping immigrant families. Time's previous covers have portrayed Trump in a variety of ways, including one from earlier in June in which Trump saw himself in the mirror as a king. No other cover, however, has so plainly questioned the morality of a Trump policy in a visual context. Many journalists have pointed out that the separation of immigrant families is a policy owned by the Trump administration. But with its new cover, Time puts the issue, quite literally, at Trump's feet.